For other people named Priscilla Chan, see Priscilla Chan (disambiguation). On February 24, 1985, Chan was born in Braintree, Massachusetts, and grew up in Quincy, Massachusetts, a suburb of Boston. Her parents were Hoa Chinese refugees who fled Vietnam in refugee boats. She grew up speaking Cantonese and served as an interpreter for her grandparents. She has two younger sisters. In 2003, she graduated as class valedictorian from Quincy High School, and was voted "class genius" by her classmates. According to a Facebook post by Mark Zuckerberg, Chan is a Buddhist. Chan entered Harvard University in 2003, where she met and began dating Mark Zuckerberg. She graduated in 2007 with a BA in biology, and also studied Spanish. She is fluent in Cantonese, English and Spanish. She is the first college graduate in her family. After graduation, she taught science at the private Harker School for a year, before entering medical school at the University of California, San Francisco in 2008. She graduated in 2012, and finished her pediatric residency in the summer of 2015. 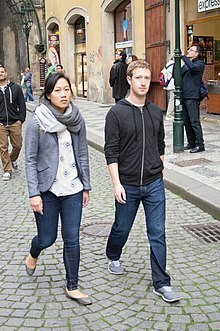 Chan married Zuckerberg on May 19, 2012, the day after Facebook's stock market launch. On July 31, 2015, Zuckerberg announced that he and Chan were expecting a baby girl. He said he felt confident that the risk of miscarrying was low so far into the pregnancy, after Chan had already had three miscarriages. Chan and Zuckerberg announced the birth of their daughter Maxima Chan Zuckerberg[A] on December 1, 2015. On August 28, 2017, Chan gave birth to their second daughter, whom they named August. Zuckerberg and Chan have pledged about $4.6 billion to charities, including a donation of $75 million to San Francisco General Hospital, where Chan worked. In 2013, they gave 18 million Facebook shares (valued at more than $970 million) to the Silicon Valley Community Foundation. The Chronicle of Philanthropy placed the couple at the top of its list of 50 most generous American philanthropists for that year. They also pledged $120 million to public schools in the San Francisco Bay Area. On December 1, 2015, Chan and Zuckerberg posted an open Facebook letter to their newborn daughter. They pledged to donate 99 percent of their Facebook shares, then valued at $45 billion, to the Chan Zuckerberg Initiative, which is their new charitable foundation that focuses on health and education. Chan's charitable goals focus on education, healthcare and science, which are closely tied to her personal background. She is considered to have had a strong influence on the philanthropy of her husband. She planned to launch The Primary School in 2016, a nonprofit organization that would provide K–12 education as well as prenatal care, in East Palo Alto, California. She was one of six nominated for The San Francisco Chronicle’s third annual Visionary of the Year award in March 2017. The award honors leaders who strive to make the world a better place and also drive change by employing new, innovative business practices. ^ "Max", Cantonese Yale: Chàhn Mìhngyúh, Mandarin pinyin: Chén Míngyǔ, written 陳明宇. ^ "Facebook's Royal Wedding". New York Times. May 25, 2012. ^ Shanahan, Mark (July 30, 2010). "Mark Zuckerberg's lady friend is local". The Boston Globe. ^ Womack, Brantly (2006). China and Vietnam: Politics of Asymmetry. Cambridge University Press. pp. 26–28. ISBN 0-521-85320-6. ^ a b c d Christina Cauterucci (December 1, 2015). "Priscilla Chan's Formidable Influence on Mark Zuckerberg's Philanthropy". Slate. ^ a b c d e f g h Hope King (December 1, 2015). "Who is Priscilla Chan?". CNN. ^ Sam Littlefair (2015-10-27). "Mark Zuckerberg says "Buddhism is an amazing religion"". Lion's Roar. ^ "Facebook founder Mark Zuckerberg to become a father". BBC News. BBC. July 31, 2015. Retrieved August 1, 2015. ^ Kell, John (8 February 2016). "Mark Zuckerberg Reveals Daughter's Chinese Name". Fortune. Retrieved 29 February 2016. In a pretty adorable video shared by the tech executive over the weekend, Zuckerberg and his wife Priscilla Chan said their daughter Max’s Chinese name is Chen Mingyu. ^ Lamagna, Maria (3 December 2015). "How Kim Kardashian and Priscilla Chan differ when it comes to 'push presents'". Market Watch. Retrieved 3 December 2015. ^ Chandler, Adam (1 December 2015). "A $45 Billion Birth Announcement". The Atlantic. Retrieved 3 December 2015. ^ "Mark Zuckerberg and Priscilla Chan to give away 99 percent of their Facebook stock, worth $45 billion". December 4, 2015. ^ "Mark Zuckerberg and family welcome new baby". CBC. Aug 29, 2017. Retrieved 2018-04-14. ^ a b "Mark Zuckerberg Vows to Donate 99% of His Facebook Shares for Charity". The New York Times. December 1, 2015. ^ "Philanthropy earns Priscilla Chan Visionary of the Year nomination". San Francisco Chronicle. Retrieved 2017-03-29. This page was last edited on 8 April 2019, at 05:28 (UTC).